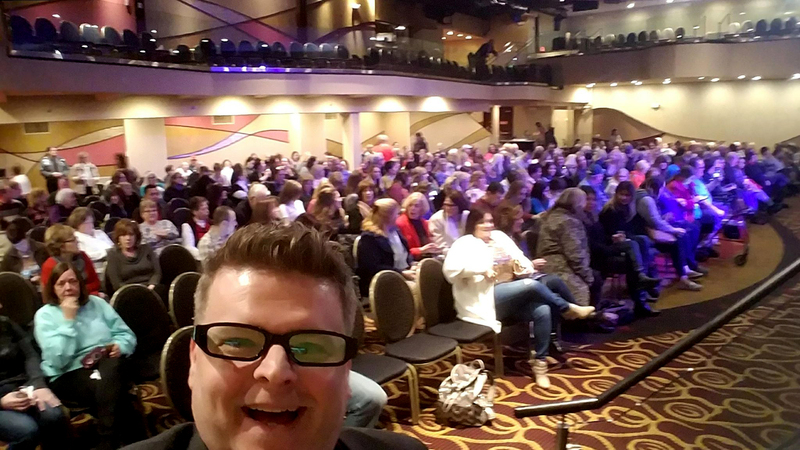 In January of 2018, I attended a psychic gallery reading at the Valley Forge Casino Resort in Pennsylvania. 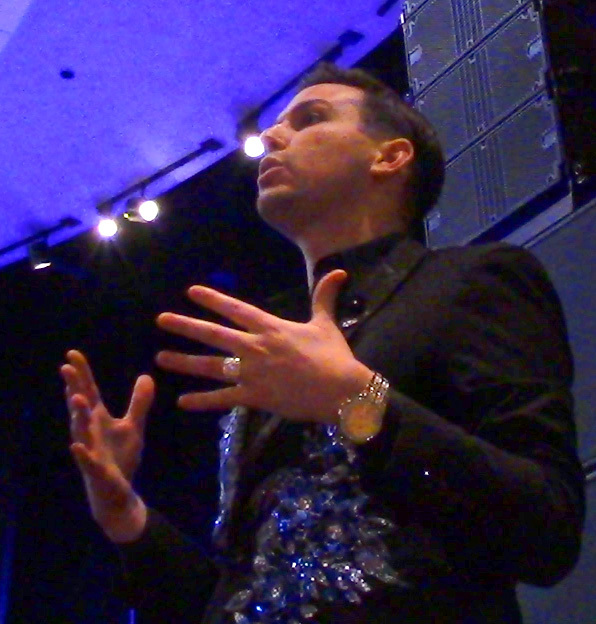 The event featured Matt Fraser, a self-proclaimed “gifted psychic medium” and author of the best-selling book The Secrets to Unlocking Your Psychic Ability (Fraser 2019). I was there, along with some friends, as secret agents taking part in a world-wide project to see just how gifted our psychic host was. I had not heard of Fraser until I was contacted by Susan Gerbic of the Guerrilla Skepticism project. I had met Gerbic in Las Vegas during CSICon 2016 and we quickly became friends. She was planning something called Operation Peach Pit: an undercover operation to determine if a particular psychic was using hot-reading techniques during their shows. For those readers that may not know, hot reading is a technique used by “psychics” and stage performers, where they use information that had previously been acquired through various research methods (social media, eavesdropping, etc.) and deliver that information as if it was received via spirits. Gerbic had run similar “sting ops” under the code names Operation Bumblebee, involving psychic Chip Coffey (Gerbic 2015), and Operation Ice Cream Cone, which focused on Tim Braun (a psychic endorsed by James Van Praagh). Even though neither of these investigations demonstrated the psychics were using hot-reading techniques, both did conclude that cold-reading techniques (where careful observations and calculated guesses make it appear as if the psychic knows more than they actually do) were employed. I’m a total geek, so naturally the idea of going “undercover” appealed to me. I agreed to participate and was instructed to gather several trusted people who would be willing to play the roles of Facebook characters with well-established profiles and complete backstories. Members of the team were world-wide from New Zealand, Australia, New Jersey, and California, all keeping the social media profiles active and interacting with each other. This was truly an international operation, which caused the geek in me to get really excited. The day before the event my team had a meeting, via Skype, with Gerbic, Mark Edward, and Jack Hitt, a reporter from the New York Times. Gerbic gave us the run-down; each of my team members were given a few bits of information about the characters they were playing. It wasn’t much, just enough to get by. For example, I was given a name, where I was from and where I was currently living, and the backstory that I thought my apartment was haunted. My character had posted various photos of orbs on social media to show people I lived with spirits (I despise orbs). All our characters were friends that haven’t seen each other in a long time, and this psychic event was a bit of a reunion. The reason for the limitation on how much information we were given was so that none of us would be able to give away specific details that could only be obtained on Facebook. Also, he couldn’t say he “read our minds” as we didn’t know any of the details on the Facebook pages; this made the sting double-blinded. The objective was to see if Fraser would take information directly from the social media accounts and relate it to us as psychic readings. If we knew too much about out characters, we might unintentionally give away personal information (fabricated or not) that would nullify the experiment. Gerbic also instructed us on what she wanted us to do while attending the event. We were to interact with as many people as possible before the show, sharing our “stories” with as many attendees as we could. During the show, if we were picked, we were to simply go with the flow. Basically, no matter what the psychic said, we were to go along with it (agree) and see how far the narrative went. Mark Edward then spoke up to give us some pointers. 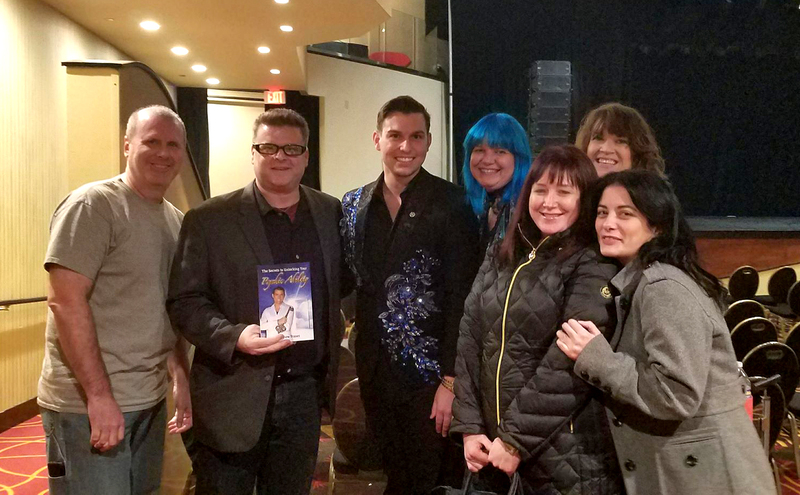 Edward is a professional mentalist and author who I also met at CSICon 2016 when my wife and I attended a cold reading workshop he hosted with Ray Hyman. Edward gave my team a crash-course in hot- and cold-reading techniques: what to look for, what the psychic will be doing, and to be alert for “plants”—people wandering around before the show to collect information. His advice was helpful and boosted everyone’s confidence. Although I had experience with this kind of thing (doing my own undercover style work), the rest of my crew had never done anything like this before. The advice and guidance from Gerbic and Edward went a long way to making everyone feel more at ease. 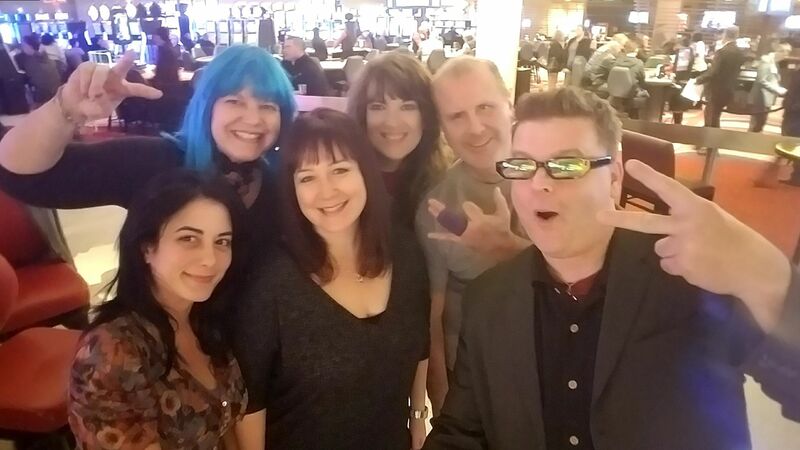 The day of the event finally arrived, and my team met up at the main bar in the Valley Forge Casino Resort. We got there about two hours early and totally embraced our characters; we all screamed in joy as we ran toward each other, hugging and claiming, “it’s been years since I saw you!” We got plenty of looks from those surrounding us, so we were definitely off to a good start. We spread out around the bar, meeting other attendees and sharing our stories (elaborating when asked detailed questions) with several groups of ladies, and they shared their experiences with us—both why they were there that day and their previous experiences with psychics. After speaking with a mother and daughter, I felt a twinge of guilt; the mother was pouring her heart out, explaining how she just wanted to contact her son and make sure he was alright. This wasn’t the first time she had been to one of Matt Fraser’s events; in fact, she had attended several with the hope of being picked and hearing one last message from her son. My guilt was felt when she asked me who I was hoping to contact. I’m usually open about not believing psychics are genuine and explaining/demonstrating the techniques of hot and cold reading, but I had to stay in character or I’d ruin the whole operation. This sweet woman told me a very touching personal story, and now I was going to recite a fabricated one back to her. Even though I didn’t want to lie to this person, I also had to keep in mind that I really didn’t know this person—she might be working for the event, she might be well-known fan of Fraser, and so on. Yeah, I sound like a conspiracy theorist … but this was part of the deal. The show was about to begin, so we all headed over to the theater. We met Fraser’s mother, who was working the front table selling her son’s books. I asked if it was okay to take photos during the event and was assured that I could take pictures and video if I wanted, which allowed me to video the entire show for review later on. We spread out over two rows of seats, with Diana sitting by herself in a different section. 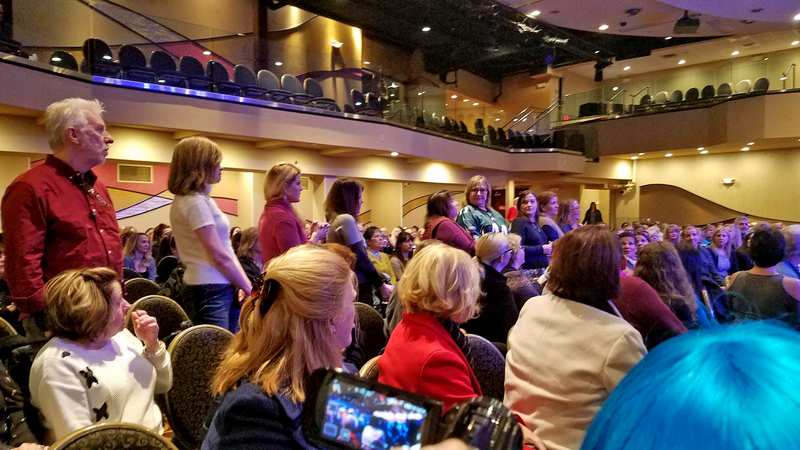 A quick survey of the audience indicated a predominantly female attendance; out of well over a thousand attendees, I only counted about twelve men. 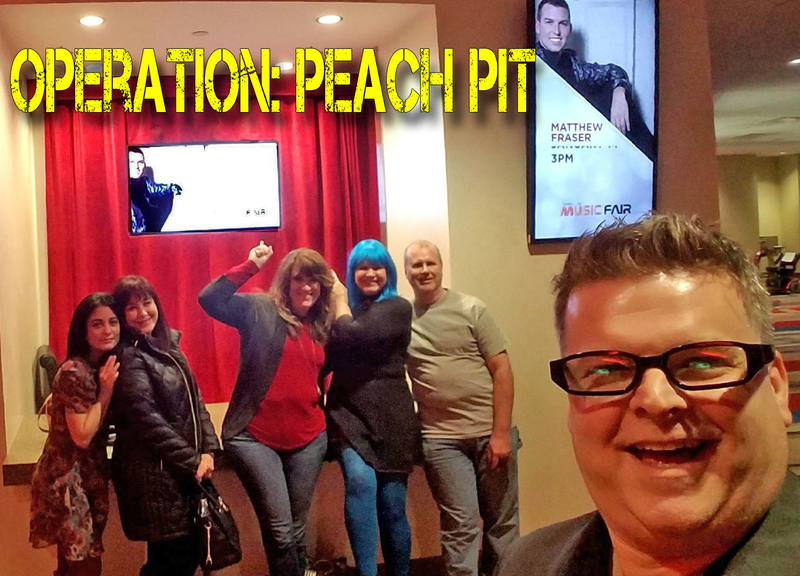 I took some photos and sent them to our Operation: Peach Pit contact, who in turn updated the Facebook pages and checked us into the event. Once everyone was seated, an announcer introduced Matt Fraser by listing his many television appearances, before welcoming him to the stage. My first impression was immediate: I found him a bit gaudy. From his over-bedazzled suit jacket to his huge gold watch and superbowl-size diamond ring, it just screamed “Look at me! I have money!” After speaking with many of the attendees, I had learned that many saved up for quite some time to afford tickets. The flashing of gold, diamonds, and sequins felt like he was flaunting it in front of his fans. As soon as he hit the stage, Fraser immediately began relating a well-rehearsed origin story of his inherited psychic powers, showing off an obvious charm and getting several laughs from his audience. He then stepped off the stage and walked among the audience as he described how the readings would go. I found this to be the standard routine I’ve heard many times before: not all messages would be clear, spirits like to talk over each other so parts may mean something to others and not you, the attendees need to help him make sense of what he says, and so on. I’ve been to several of these events with John Edward, James Van Praagh, and multiple psychics at Lily Dale, New York—and I’ve heard the same speech from all of them. It’s basically a disclaimer to cover their butts when getting things wrong, usually putting the blame on the attendee (sitter) rather than the psychic. Fraser claims he can “help others by connecting them to their loved ones and delivering heartfelt messages from the Other Side. Matt’s special gifts are in bringing through validation with names, dates and details from your loved ones in Heaven.”(Fraser 2019). However, that’s not what I witnessed during the next two hours. 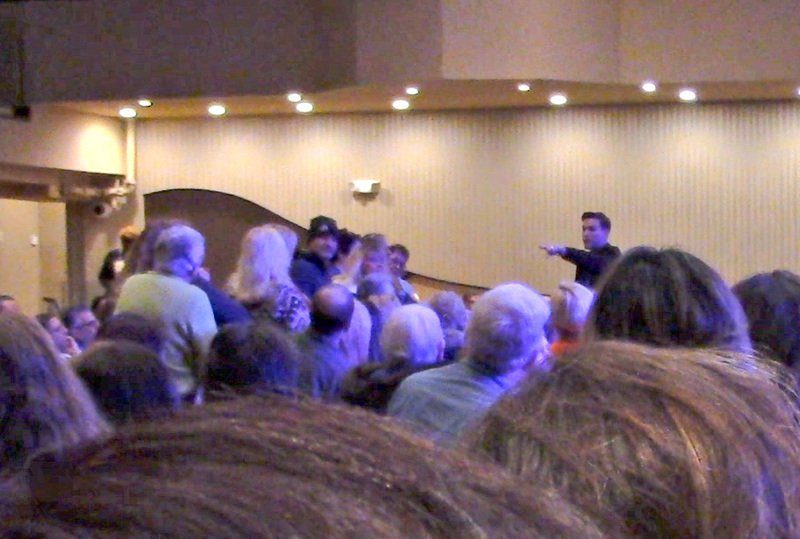 Instead, I watched Fraser ask entire rows of people to stand up at a time then commence throwing out general statements (e.g., I’m seeing a father figure that passed) and waiting for someone in the row to claim it was their relative. Although picking out specific rows gave an impression he’s already narrowed down who he’s supposed to be reading, he was actually giving himself a one in twelve chance that someone will be hooked by one of his general statements, depending on the number of people in the row. He didn’t come up with specific names or even dates, instead he tossed out random numbers such as “three” and usually left it up to the attendee to make a connection. Such numbers, given without proper context (e.g., Does the number three have any meaning to you? ), can relate to anything from a day, month, or time … to part of an address or age or number of grandchildren. It’s an open-ended guess where the attendee is under pressure (from thousands of staring audience members) to make a connection. Once a connection is found, it is counted as a “hit” for the psychic and is taken as he knew what he was talking about all along. Once someone was hooked, Fraser would then zero in on the target, employing standard cold-reading techniques: offering general statements and quickly asking questions and rephrasing the answer to seem like he already knew the answer. As he read a woman sitting a few rows behind me, I heard Fraser ask, “Now is your mom also departed?” When the woman agreed, Fraser followed quickly with “Know that she is also stepping forward now.” He obviously didn’t know, but used the information given up by his target to his advantage. A few moments later, Fraser also asked the same woman if her husband had recently departed; he was and amazing came through just at that moment. Why is he asking about things he should already know?! Because he’s not psychic, that’s why. Perhaps the worst part of his whole routine was when he would scold an audience member for not making connections. Although he tried to do it in a “funny” way, I found that Fraser was actually quite rude and arrogant at times. He told people such things as “Hello! Would you pay attention? !” several times, often making the person look silly. This seemed to get a laugh from most of the audience, though I still don’t understand why. This attitude came out when Fraser was racking up the “misses” and/or when his target was not forthcoming with the necessary information required to continue his routine. Edward explains further: “When Fraser has a row of people stand up, he goes to one end and stands just slightly in front of the row, leaning forward so he can see all their faces and body language. He states a standard fishing line such as he’s ‘getting an impression’ of something. For our example let’s use, ‘I’m feeling someone has just lost a father figure.’ As he states this and in this same moment, he brings up into view his pointing index finger and begins the process of generally pointing it at the row. He’s scanning for a reaction here. In the split second between when someone acknowledges his ‘vision’ and the movement of the raising of his arm toward the group, he locks in for a reaction and if there is a positive indication to his statement, he simply course corrects onto that one person in the row. Boom! To the majority of audience members, this appears to be a direct hit. Simple isn’t it? This is one of those things in staging and presentation that sells the psychic or mediums’ ‘accuracy.’ With some practice, it’s yet another powerful weapon in the mediums’ arsenal.” Standing to the extreme end of the row means that when the psychic points he does not have to move his finger/arm much to look like he was always pointing at the person who reacts. If he were standing directly in front of a row of twelve people and pointed at them, it would be much more obvious when he moved his finger/arm to point at the person who reacted. Standing to the extreme side made it look like he always knew who he was getting the message from (Edward 2019). Although there was a lot of work put into this operation, none of my team members had a chance to get a reading. This isn’t too surprising; we were only six people in a sea of well over a thousand attendees. As we made our way out of the theater, we did get the opportunity to speak with Fraser after the show. He was doing a small meet and greet, autographing copies of his book. I purchased a copy and had him sign it. My team and Fraser chatted about who we were and our various reasons for coming to the show. Fraser accepted our stories without a hint of doubt—even while I was constantly thinking in my head “Tell me I’m a making this up … tell me you know we’re here undercover.” Alas, he did not. In conclusion, we didn’t see any signs of hot-reading techniques. To be honest, I don’t think there was any need for such techniques during an event like this. 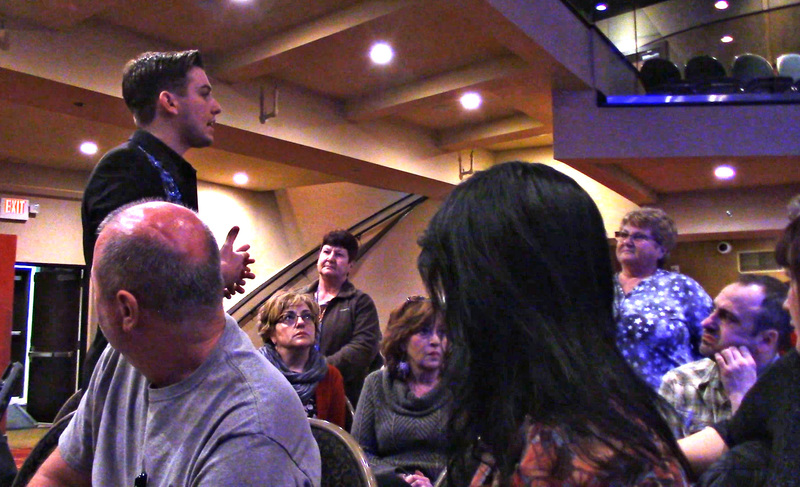 From what I could gather through conversation and eavesdropping, many of the audience members were repeat customers and firm believers in psychics and their alleged abilities. With a few general statements and quick questions, I think even the most amateur psychic could have worked this crowd. I didn’t observe any “spectacular revelations,” nothing that came from such pinpoint accuracy that it would make me think Fraser had any pre-show knowledge (or psychic gifts). Edward, Mark. 2019. Personal correspondence. Fraser, Matthew. 2019. Matt Fraser Psychic Medium. Available at https://meetmattfraser.com/. Gerbic, Susan. 2015. Operation Bumblebee. Available at https://www.csicop.org/specialarticles/show/operation_bumblebee. ———. 2015. Operation Ice Cream Cone. Available at https://www.csicop.org/specialarticles/show/operation_ice_cream_cone.